Though being a small educational township, Manipal can pretty well boast of its cosmopolitan culture, not only in terms of students from all around the globe but also for the varied presence of eateries to tickle your taste buds. Almost every nook and corner of Manipal accommodates food joints. As a matter of fact Manipal enjoys the privilege to respond expeditiously to your hunger pangs and serve delicacies at your doorstep even at 4 in the morning (Planet Café, Pizza King). Tiger Circle, the centre of Manipal has a few decent restaurants namely Dollops, Hangyo Saiba, Snack Shack. Cheap Vada-Pav’s are sold right across the street from Saiba and it sells well. For those who have an insatiable and uproarious appetite for chicken: Tandoori and barbecue items at Hotspot, KFC impersonation at Chiko’s (KMC food court), La Saani, Dishes & Red are the right places. For lavish dining, Valley View is the answer. Cosmo Café there serves a wide variety of cuisines and buffet meals. Breakfast buffet priced Rs 200 is quite popular even among the students who devour beyond capacity to enjoy the wide variety of sausages and other stuffs. Parothas at Parotha point can be quick meal and light on the pocket too. Cheese Omelette with bread toast at Vikram’s is delicious. Tiwari chat at KC and behind Venugopal temple tantalize your taste buds with their variety of chats and pani-puri. 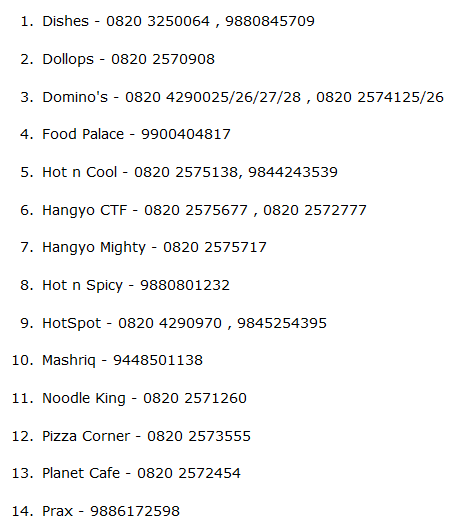 For the brand savvy kind, Manipal has Dominos, Subway and Pizza Corner. The double burst pizza at Dominos is the local favorite which is indeed mouth watering. To savor a cupid moment you can choose to eat under open air at KMC greens. If you have a sweet tooth for deserts and you’re looking for a right place to hit in, Piccolo’s is the ultimate ice cream parlour in town. Death-By-Chocolate at Snack Shack is tantalizing. For cake and pastry lovers, Scirocco and Cosmo Café are your paradise. Started recently, MIT food court has started serving pastry at rock bottom prices, just 10 bucks.! To mix fun and snacks, Scooby Doo is the place. You can play fussball, other video games and devour on ice creams. But be sure to go there early if you want to get a table. Last but not the least, DeeTee: it is the most happening place in Manipal. Drinks, food and music rule this place and truly define Manipal. Manipal is indeed a food hub which caters to the need of all students. The common orthodox perception that people in the Southern part of India have to survive on ‘Idli and rasam’ was busted. I m not a glutton but an avid foodie and an explorer, for I firmly believe that “The belly rules the mind.” Food is our common ground for universal experience and sometimes the discovery of a new dish can do more for human happiness than even that of a star.